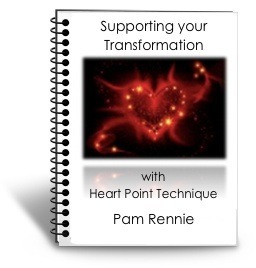 Pam Rennie – Heart Point Technique Master — Heart Point Technique (HPT) is an inspired spiritual/energy healing modality. Designed specifically to be nurturing, yet powerful and effective in permanently shifting barriers to progress. Using soothing, Light-source energy from the Divine, this simple and innovative modality connects you to the deep, innate wisdom held within your heart, which is essential to all healing. Wow, It’s happening again. That was my first thought. Then I paid attention to the sound I was hearing, but had not been focusing on. It was a Morse code type of tapping sound. It was coming from this sweet Rose hanging in my window. This time there was NO visible movement. None at all. But the sound was very distinct. It was 11.11 and I was sitting in the portal energies when I began to pay attention to the sounds. It went on for a while as I sat in the energy and messages being shared. The first time this happened I was prompted to share the compelling experience and the Rose Tool. The sound had not happened once since then. The tapping incidents we almost exactly 1 year apart to the day and both times fires were raging in California. This was something to pay attention to. Here is the original post which contains that experience and a link to the Rose Tool for you. I was sitting at my desk enjoying the sacred space in the room where the magical client sessions take place. I was feeling quiet and contemplative. Then something got my attention; I had heard it the other day too, but had ignored it. This time I listened and heard the faint tapping knocking kind of sound. It almost had a rhythm to it, a regular tapping beat for sure and very faint. I stood up and put a deeper focus on, where is this sound coming from? I let my ear actually lead the way, leaning into the direction of the sound. There it was! I paused and stood back looking at the window directly in front of me. It was the stained glass hanging of The Rose. That was the source of the sound. How curious! There was no movement of air in the room. The Air-conditioning was off, window closed, yet I could see it moving back and forth making the gentle tapping sound! 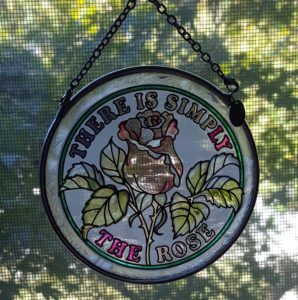 I sat back in amazement as I gazed at the writing on the stained glass: There Is Only The Rose. This sweet hanging was a gift from a very dear friend and had hung in this spot silently for over three years. Spirit had done this to get my attention. I was curious to say the least. As I reflected on the Rose tool I thought of the ways I used this tool daily. With an almost audible sound, the guidance said, “use it more often and in new ways.” Huh, I thought, what an interesting way to get my attention with this Divine request. The fires raging in California came to mind. 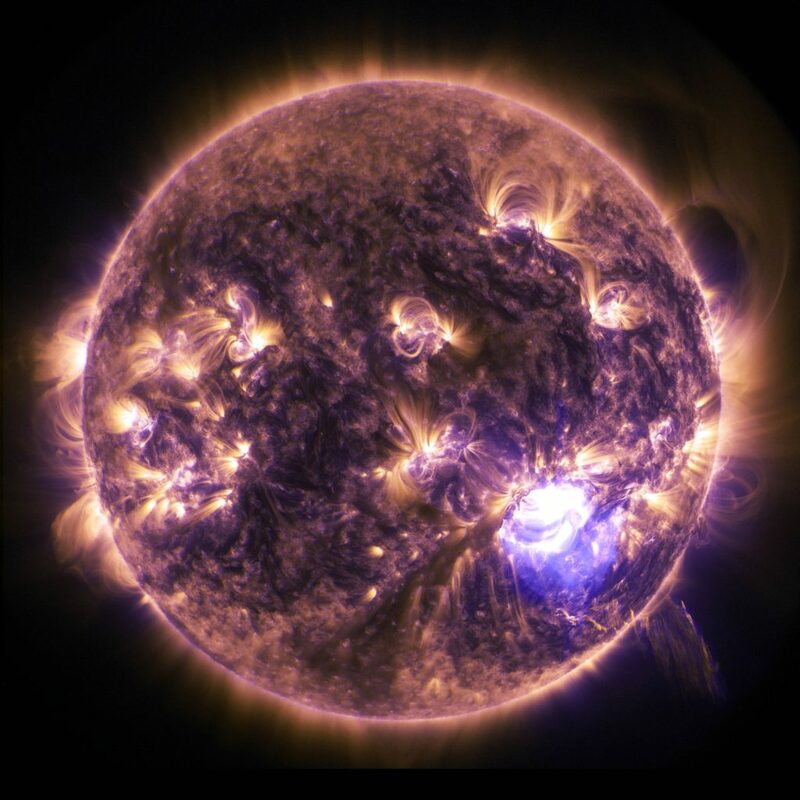 I had been sending prayers and doing energy work with the Elemental’s as guided. Containment had been the very first word/thought when I began this work, and now I saw to place Roses around the fires as a containment. Interesting. The Rose Tool used at the edge of your Aura creates a line of delineation or a separation, so placing this sacred tool of Alchemy around the fires made sense to me. As I did that and pondered on the Rose Tool a bit more I noticed the tapping sound had stopped. Completely stopped. Information and guidance often comes to many in different ways with a similar message or nudge. The Question is: Are we paying attention? I have continued to use the Rose tool more often and am grateful for the nudge to do so. Here is the best part. YOU can use this tool of Alchemy too. Listen to this recording The Rose Tool as I share with you how you can use the particular application of the Rose Tool to Defining your space and create a container for you to experience you in your energy field and not be the effects of others energies. You will experience how beneficial this tool is. We do Thanksgiving big at our house and I love it. The whole family comes home and the holiday is steeped in traditions. Which also makes for a lot of work and days of preparation. This Thanksgiving was remarkably different than any other before and not different at all. The remarkably different part was me and how I experienced not only Thanksgiving day, but the entire week leading up to it. The not different part was the life all around me. It was the family things going on and even a bit busier with more on my schedule. 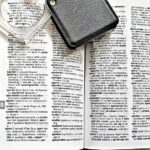 How did I feel my experience was different? There was zero stress. Zero. No feeling of being in a rush, even amidst tackling a long list of things to do and check off. I was excited, happy, full of energy and very present in the moment. I was all at once in a single moment of many moments the accumulation of everything I have been teaching and sharing. I was grounded, calm, focused, present, senior and happy. Really happy and excited. I was looking forward to the day of Thanksgiving and also enjoying each moment along the way. I was in Gratitude each day. Yet, this was still different in experience on levels that have no words and I wanted to know how and why. I wanted to bottle it and keep drinking from the bottle everyday because this was fun! This was exciting and it was Freedom, Ease and Accomplishing. Ah, that was it! The bells went off as soon as I typed Freedom Ease & Accomplishing. That was the key stone. That had been my intention and it came to be in a larger than life way. It was during a Mastering Alchemy conference that Lord Metatron said, “this will take 5 years of your time to be fully able to experience this template of Freedom Ease and Accomplishing” Well, ok it took me 7. Maybe I was on the slow train. While this template Lord Metatron presented, that I had used so often was the end result and the present experience, there was more. The more of my experience was also about a State of Being. It was an example of how rapidly we are manifesting our desires and intentions and how it can be done with ease. I put in motion what I desired using the tools of Alchemy in my tool box and the power of my intention. Then I went about my life. Here is another key. I went about my life BEing excited, happy and in Freedom, Ease and Accomplishing. I wasn’t looking for it all to happen by trying to find it or doubting it would happen. I attached the feeling and emotions to what I wanted to experience. Metatron says this piece is essential for manifesting; attaching the feeling and emotions. Why is this so exciting? It could seem ordinary, but the experience was nothing ordinary. It was outstanding! The excitement is this is for you to experience too. The platform of Freedom, Ease and Accomplishing and all the tools and key’s of Manifesting are right here for you too. It all begins the simple questions, How do you choose? How would you like to experience yourself? Then, the key; set your Intentions, write them down and do keep your attention on what you are intending for a most favorable outcome.